To save time without losing the precision cut you want, Whiteside Machine makes Double Edge Round Over router bits. 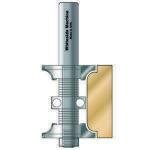 These adjustable double corner rounding Whiteside bits allow woodworking craftsmen the ability to knock off both corners at the same time. These Double Edge Round Over router bits are manufactured by the award-winning Whiteside Machine Company. Take a moment and scan the list below to choose the best one for your next project.